When President Obama and the Department of Energy (DOE) launched the EV (plug-in electric vehicles) Everywhere initiative in 2012, the DOE said electric vehicles need to be 30 percent lighter, battery costs have to drop from $500 per kilowatt hour to $125 per kilowatt hour and electric drive systems must drop from $30 per kilowatt down to $8 per kilowatt. 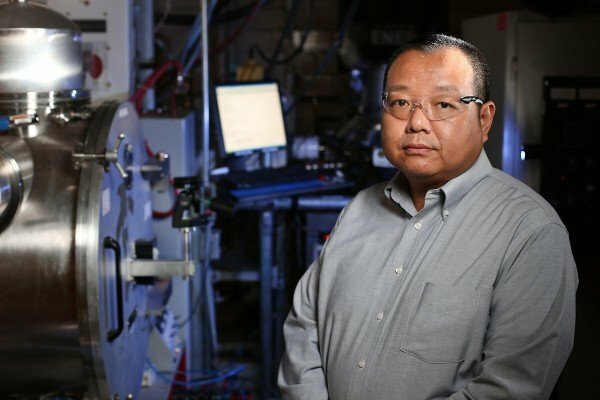 “Typically, in the engineering world, when you have a problem like this, you look at the system, for example the motor design,” said Jun Cui, an Iowa State University associate professor of materials science and engineering and a senior scientist with the DOE’s Ames Laboratory. But electric motors have been around since the 1830s. The easy system solutions were found long ago. A research team led by Cui is working to meet the demand for better materials and performance in electric motors. To support their work, they’ve just won a three-year, $3.8 million grant from the DOE’s Vehicle Technologies Program. Of that, $2.8 million will support research at Iowa State. The project also includes research partners from the United Technologies Research Center in East Hartford, Connecticut; and the University of Delaware in Newark. Cui said the project was made possible by combining the research expertise and facilities of Iowa State and the Ames Laboratory. Local collaborators include Scott Chumbley, a professor of materials science and engineering and scientist for the Ames Laboratory; Peter Collins, the Alan and Julie Renken associate professor of materials science and engineering and an associate scientist of the Ames Laboratory; Iver Anderson, a senior metallurgist for the Ames Laboratory and an adjunct professor of materials science and engineering; Valery Levitas, a Schafer 2050 Challenge Professor of aerospace engineering and an associate scientist of the Ames Laboratory; Frank Peters, an associate professor and associate chair of operations in industrial and manufacturing systems engineering; and Matthew Kramer, director of the Ames Laboratory’s Division of Materials Sciences and Engineering and an adjunct professor of materials science and engineering. Cui said the project’s modeling and basic experimental efforts will be based at Iowa State and the large-scale casting and part molding will be based at the Ames Laboratory. Cui said the grant would not have been possible without his prior steel research at the DOE’s Pacific Northwest National Laboratory in Richland, Washington. The grant is part of a $59.2 million federal investment in 35 research projects aimed at reducing the cost and improving the efficiency of electric, alternative-fuel and conventional vehicles, according to a DOE announcement. Cui’s research team is working to develop motors with the stator core (a non-rotating, magnetic part) manufactured with thin layers, or laminations, of a new “electrical steel.” The new steel will be an iron alloy containing 6.5 percent silicon, twice the amount used in electric motors today. Cui said the extra silicon increases the electrical resistivity of the material by about 50 percent. And that reduces eddy currents, heat and power loss in the motor. That’s very important as researchers work to develop the next generation of electric motors. Cui said he sees those motors running at much higher frequencies — jumping from today’s 60 hertz all the way to 400 hertz. That produces a much higher motor power density, Cui said. And that means motors can be smaller, lighter, more powerful and more cost effective. Running at higher frequencies also lowers motor efficiency. Cui said the new electrical steel his team is developing can reduce those efficiency losses. But there’s a problem: Steel with extra silicon is brittle and expensive to manufacture. “It will crack if you drop it,” Cui said. The Iowa State-Ames Laboratory researchers will study and characterize different processes for making electrical steel so it’s more ductile and cheaper to make. Cui said the researchers are also committed to developing materials and motors that don’t depend on magnets made with rare-earth materials. That saves the motor industry from the rising costs of rare-earth materials. Web Source: Iowa State University.